Do you love shopping for branded bags, wallets and watches? Yes, I do too! But as you know, I'd always prefer to shop at a bargain. Good thing, there's a new online seller on Facebook, Besh Shoppe Ph, where I could buy my favorite brands at discounted prices. What's more? I could be assured that the goods I bought are genuine and authentic. They buy from outlet stores in the US, that's why, their prices are very reasonable. Besh Shoppe Ph is a collaboration of enterprising ladies who have been friends since high school. They call themselves Besh so when they decided to put up their own online business, it was aptly called Besh Shoppe. Besh Shoppe Ph sells authentic brands (yes, I can guarantee they're authentic) at the the best price. Check them out, as well, at the upcoming Noel Bazaar Series this Nov and Dec.
As Manila Shopper readers, you get a chance to try one of their products! 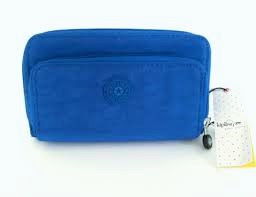 Get a chance to win an authentic Kipling Women's Stella Continental Wallet (Blue). Description: An outer front zip pouch ups the ante and keeps essentials at hand while the inner card slots, billfold and zip pocket keep the rest in order. So guys, let's do this! Just don't forget to post a comment below! wow! they are so generous! i hope to win this purse from Besh Shoppe PH. thank you so much! I am hoping to win! My mom would be very happy to receive it! My favorite color i want it!!! Wow early Christmas present from Besh Shoppe Ph yey. Would love to give this as a present for my Mama. 😊 Thank you. I love anything kipling. Hoping to win. Joined! I hope to win, I love Kipling! Not lucky on raffle but hope to get this one. Perfect gift for my mom. pic me pls for my bff ..
Kipling products are amazing... And I want one.. Subrang ganda po kasi ng quality kaya I can't afford to buy them. So I am trying my luck here. I would be very happy if chosen as a winner. Maagang pamasko po ito if ever. God bless!!! Hope to win as a gift for my mother this christmas. Wow! It's good to have another option to shop online without a hassle and to know that the products are authentic at a cheaper price is really a plus. Will give this a try. I hope I win that pretty blue wallet! I hope and wish to win!!! This will going to be an early birthday present. If I won.. haha. praying and wishing to win for my beloved mother. hoping to win for my mom. Kipling Wallet from Besh Shoppe Ph is crafted from signature brand that is super-stylish, versatile & trendy. A must-have for every girls like my Sister to keep her cash & cards safe and secure that has a classic design to boot! If given a chance to win, I will give this to my Sis as a gift to her because of her dedication on her profession as a nurse in a public hospital. She patiently works on a mind killing graveyard shifts and deals with ill-tempered patients but still she manages to impart admirable service with tons of Tender Loving Care. I'm pretty sure that she would love this girly stuff that will kinda paid off her significant role in our society. From my heart to yours... THANK YOU! God bless us all! I love it! I wanna have that!! Hoping to win for my daughter. She really loves Kipling wallet. *never pa. Hopefully talaga ..
Yey! Thank you so much! Ang agang paMerry Christmas.